Did you know that reading fiction increases empathy and emotional intelligence? According to research, reading fiction can help children put themselves in other people’s shoes. And I think encouraging empathy for all types of people can make the world a better place. Want a place to start? 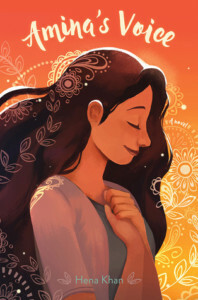 Here are some great children’s books featuring Muslim characters. Check one out for a child in your life today. 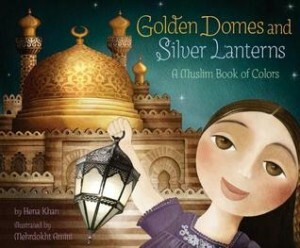 Golden Domes and Silver Lanterns: A Muslim Book of Colors by Hena Khan illustrated by Amini Mehrdokht (2012). This beautiful color concept book links colors to Muslim customs, clothing, or concepts like a red prayer rug, a blue hijab, etc. This picture book is a great choice for children ages 3-7. See also Crescent Moons and Pointed Minarets: A Muslim Book of Shapes. 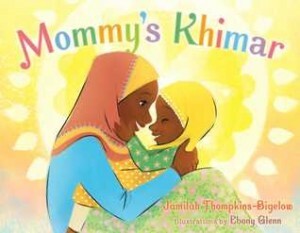 Mommy’s Khimar by Jamila Thompkins-Bigelow, illustrated by Ebony Glenn (2018). A young Muslim girl puts on a head scarf and not only feels closer to her mother, she also imagines herself as a queen, the sun, a superhero, and more. 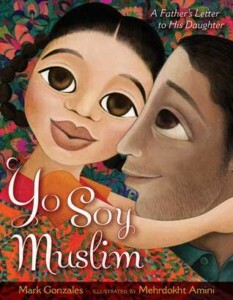 Yo Soy Muslim by Mark Gonzales, illustrated by Amini Mehrdokht (2017). A lyrical celebration of multiculturalism as a parent shares with a child the value of their heritage and why it should be a source of pride, even when others disagree. Power Forward by Hena Khan (2018; 126 pages). Fourth grader Zayd dreams of being the first Pakistani-American in the NBA, but when he skips orchestra rehearsal to practice basketball, his parents forbid him from playing. This is a great choice for fans of sports books and realistic stories. 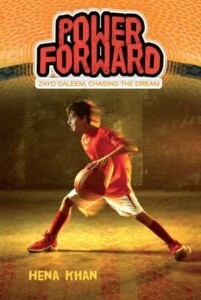 And if you like this one, check out more books about Zayd: On Point and Bounce Back. Amina’s Voice by Hena Khan (2017; 197 pages). Amina is a contemporary Muslim girl who’s dealing with a lot of universal issues that middle schoolers deal with – her best friend is becoming friends with a girl who was mean to Amina, her uncle from Pakistan is coming to stay with the family for three months, and she’s nervous about an upcoming public speaking competition at her mosque. Hand this to upper elementary and middle schoolers who like modern stories of friendship and growing up. The Gauntlet by Karuna Riazi (2017; 298 pages). 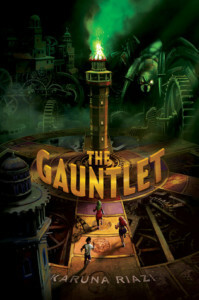 When twelve-year-old Farah and her two best friends get sucked into a mechanical board game called The Gauntlet of Blood and Sand, a puzzle game akin to a large Rubik’s cube, they know it is up to them to defeat the game’s diabolical architect in order to save themselves and those who are trapped inside, including her baby brother Ahmed. This is a great choice for readers who like fantasy adventure stories. 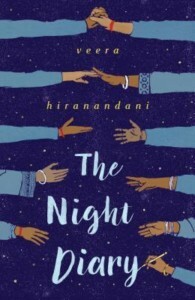 The Night Diary by Veera Hiranandani (2018; 264 pages – also available on e-book via Overdrive). Half-Muslim, half-Hindu 12-year-old Nisha is caught in the middle when India is partitioned into India (Hindu) and Pakistan (Muslim) in 1947. The people in government who are supposed to protect the citizens seem to be tearing everything apart and Nisha is not certain where she will land. This historical novel is a great choice for readers who liked I am Malala or Anne Frank’s Diary of a Young Girl. Does My Head Look Big In This? 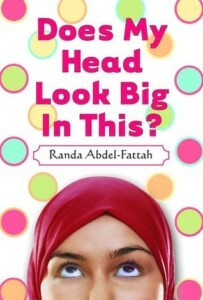 by Randa Abdel-Fattah (2007; 360 pages). When 16-year-old Amal makes the decision to start wearing the hijab full-time, everyone has an opinion. This funny novel celebrates a teen’s decision to stand up for herself and make a decision for herself, even if it’s not always easy. 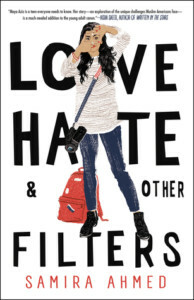 Love, Hate, and Other Filters by Samirah Ahmed (2018; 281 pages). Maya just wants to love who she loves and do what she loves – she wants to go to New York to study film, but her parents want her closer to home. And they’d never approve of the white boy she has a crush on. But everything changes when an attack at the state capital is mistakenly blamed on a Muslim man – suddenly Maya’s family is the target of attacks themselves. Saints and Misfits by S.K. Ali (2017; 328 pages). 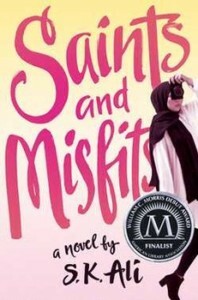 Fifteen-year-old Janna Yusuf, a Flannery O’Connor-obsessed book nerd and the daughter of the only divorced mother at their mosque, tries to make sense of the events that follow when her best friend’s cousin–a holy star in the Muslim community–attempts to assault her at the end of sophomore year. 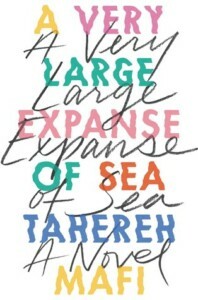 A Very Large Expanse of Sea by Tahereh Mafi (2018; 310 pages). A year after 9/11, Muslim teenager Shirin has completely withdrawn from social life, until she meets Ocean James in her biology class and is tempted to actually let her guard down.